For the most part, the Real Housewives of Potomac cast has really stepped it up for Season 3. The same cannot be said for the last episode of the show. The primary “conflict” was the women’s choice between Monique Samuels and Robyn Dixon’s events- which were coincidentally scheduled for the same night. Monique didn’t seem to care if people chose Robyn’s event over hers, but Robyn took it very personally when some of the women decided to attend Monique’s. Karen Huger said that she would try to go to both, but Robyn just wasn’t having it. Can we get back to talking about tax evasion and alleged affairs with blue-eyed men? Those storylines were way more interesting than this “drama”. Karen continued, “Forget protocol, Robyn would have both Charrisse and me cancel on Monique just because she feels a certain way about Monique. Dare I say it? Robyn appears to be jealous of Monique. Why is it that Monique understood that it was simply a calendar conflict and Robyn chose to make it personal? Robyn needs to deal with her personal issues and stop demanding that her friends choose one or the other.” If another cast member (who Robyn doesn’t have beef with) held an event on the same night as Robyn’s, would Robyn be just as offended? 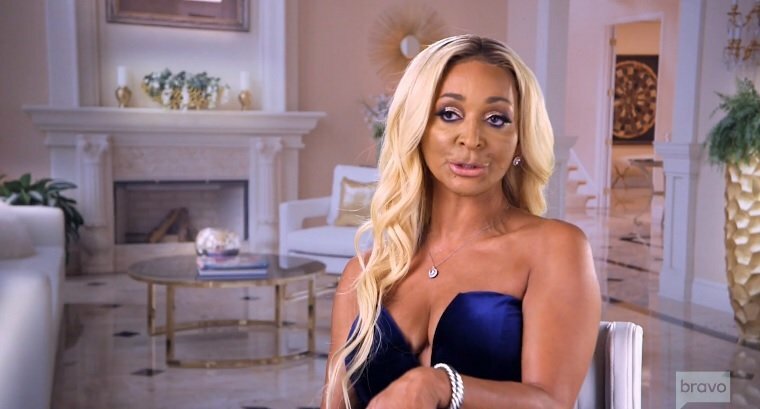 The Grand Dame of Potomac concluded, “Be very clear, given Robyn’s disloyalty towards me I’ve learned to move with caution where she is concerned and rightfully so. Robyn’s comments about me in her follow up interview were lowbrow and a futile attempt to deflect from her own personal financial and emotional struggles. I wish Robyn well with that.” Shade thrown. TELL US- IS ROBYN JEALOUS OF MONIQUE?